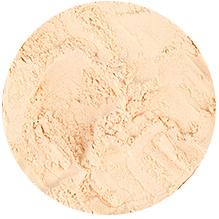 Lucuma Powder is a healthy and low-sugar sweetener that also provides 14 essential trace minerals. This product is a good source of antioxidants, dietary fibre, healthy carbohydrates, vitamins including beta-carotene, niacin and minerals including zinc, potassium, calcium, magnesium and iron. Lucuma powder is a natural low-glycemic, raw sweetener that is low in sugars but high in beta-carotene, niacin (B3) and other B vitamins, fibre, calcium, iron, and low in fat. It is gluten free and a source of antioxidants. High in potassium, sodium, calcium, magnesium and phosphorus. Lucuma powder can be added to flavour and sweeten ice creams, milkshakes and desserts. The powder can also be used in pies, cakes, cereals, and pastries. Also, it is a favorite sweetener amongst raw foodists, for its maple syrup taste and health properties. This type of powder is a very popular ice cream flavor in Peru, because of its sweet taste.